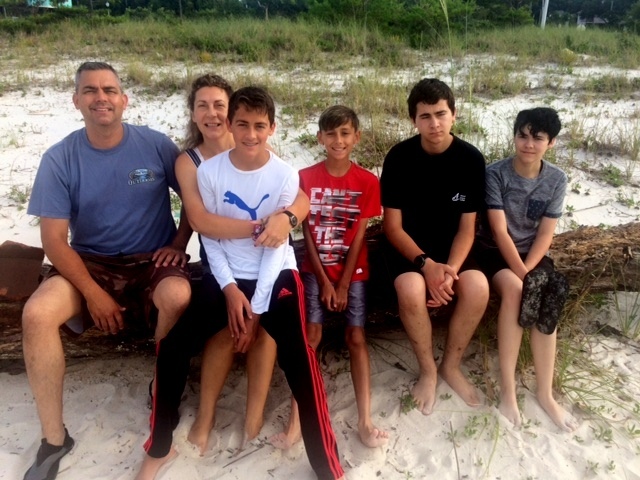 A lot of compromises went into this family vacation. I’ve already mentioned that we were trying Airbnb in the hopes of having more space for the kids than in the average hotel room. It was costing me some extra money, but it was costing Pretty a whole lot of aggravation. Since I don’t have a smartphone (and she does) we were using hers to manage the Airbnb app—-messaging hosts for check in information and questions about fridges, pools, washer/dryer, etc. For the record, I also made her use her Smartphone to search for and play podcasts for me while I was driving. That’s what Pretty gets for being responsible enough to earn her own money and pay for her own Smartphone and service. It’s a good lesson to learn: The more responsible you are, the more responsibilities other people will dump on you. (Hey, just trying to prepare her for marriage and motherhood.) But Airbnb wasn’t the only compromise. I also folded on the no-electronics-in-the-car rule. I used to insist on audiobooks for the kids during car rides. Then we tried family discussions using the Book of Questions. That was….interesting. But this year I gave in and borrowed a hot spot from the library and let the kids connect their devices to their hearts’ content. The question “Are we there yet?” was quickly replaced by “Did we lose the wi-fi?” Because there are places in the wild, wild west where there is no service, but there were actually hours and hours of silence when the kids were completely absorbed in whatever it is that they do online. And it was lovely. So now I promise to be a little less judgy about the people handing their toddler a Smartphone in a restaurant. Although I am really more jealous than judgy. Because we had to carry coloring books and crayons and help our toddlers with color-by-number or play hangman or tic-tac-toe (and let them win) while waiting for our food. Why do modern parents get to enjoy adult conversation over dinner with just a little bit of beeping in the background? So. Unfair. There was another compromise, too. You see, I am a morning person. Not by choice, of course. Before I had kids and a farm and a job in EMS I liked to sleep in as much as the next person. I was normal. It’s just that I had to get up to feed babies at 4am and sometimes they didn’t want to go back to bed. I had to get kids up for school at 5:30am and after they got on the bus at 6:10am their siblings were already waking up for the day. I had roosters crowing at the crack of dawn and goats waiting to be milked soon after. I now have a job that requires me to be at work by 5:45am and a brain that requires enough time for at least one cup of coffee before I get there. After more than 15 years of forced early mornings, my internal clock realized that “normal” was over for me. Done. Kaput. And now it considers sleeping in to be getting up at 7:30am. Which, I know, is weird for some people. People like the rest of my family. So when we are on vacation, I am up and about while everyone else is hoping I will go back to bed or drop dead, whichever makes me shut up and turn off the light faster. Meanwhile I am wondering if we really drove 1,000+ miles across the country so everyone could lay in bed, waiting for it to get to 100 degrees outside (you know, perfect hiking temperatures) before they wake up. Needless to say these differing philosophies caused some problems last year. So I tried to give myself some morning activities in places that we visited. Things I could do to kill time until the lazy sleepy people got up. Last vacation I spent a lot of early mornings visiting laundromats to do laundry while everyone else slept. 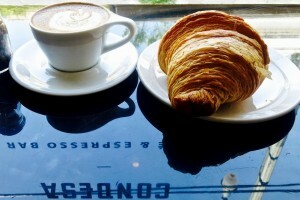 This year I found some better morning choices. And now that Pretty is older (and a morning coffee drinker) she did a lot of them with me. 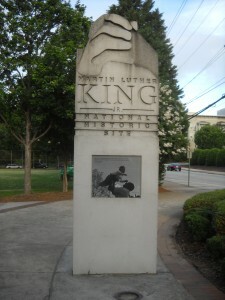 In Atlanta we got up and headed to the Martin Luther King, Jr National Historic Site, which was just a couple miles from where we were staying downtown. 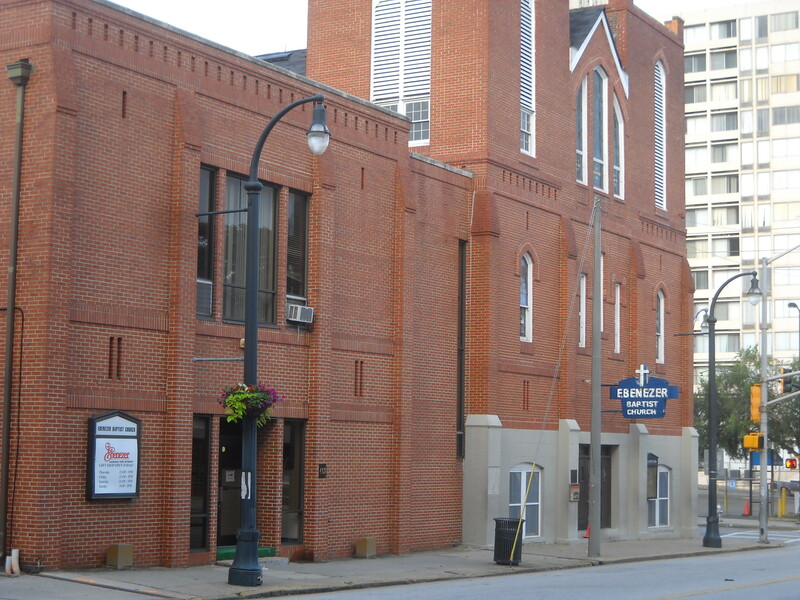 When we finished breakfast, we strolled around the Sweet Auburn Historic District which includes the house where Martin Luther King Jr was born and grew up, Dr. And Mrs. King’s tomb, historic fire station No.6, and historic Ebenezer Baptist Church where he and his father were pastors. 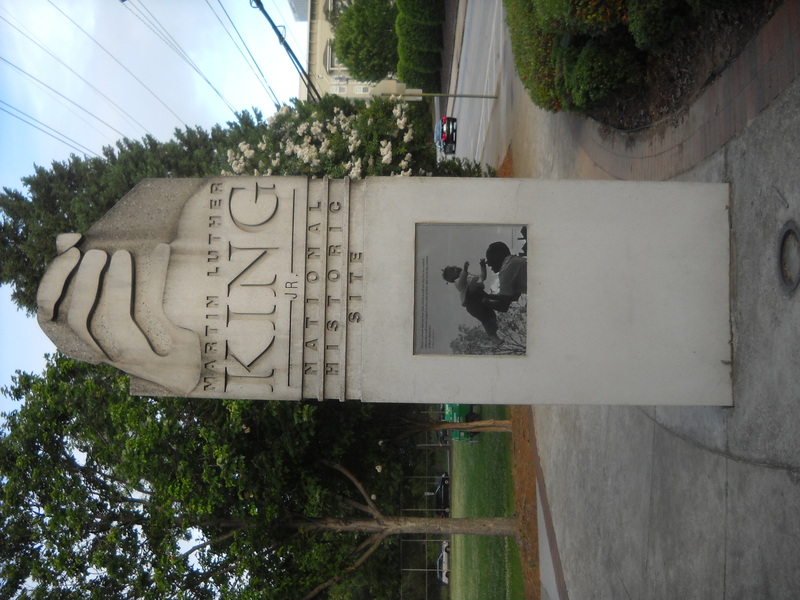 The community is sprinkled with informational plaques detailing the historic buildings. We didn’t have time to do the inside tours of the home or church (Tours didn’t start until 10am. They were scheduled for normal people.) but we got lost wandered around the 6 block area quite a bit. A lot has been written about the power of place—how geography relates to shared and individual identity, whether we’re talking about public areas, national parks, or even work spaces. And it’s true. There are places that have touched history and a sense of that remains. Home places are powerful; even country people visiting the big city know that. Of course some places are historical and tacky all at the same time. Since the famous soft drink, Coca-Cola, was invented in Georgia (and Diet Coke is my drug of choice), we decided to hit the The World of Coca-Cola Museum before leaving Atlanta. Which was gawdy and gimmicky and, yeah, fun, too. They had a room of antique memorabilia, tour guides that were so exhuberant I think they were on a whole different type of coke, lots of interactive exhibits, a 4D movie, and Coke, Coke, Coke products everywhere! Everyone liked the tasting room best. It was an entire room of drink dispensers that had Coke products from all over the world. 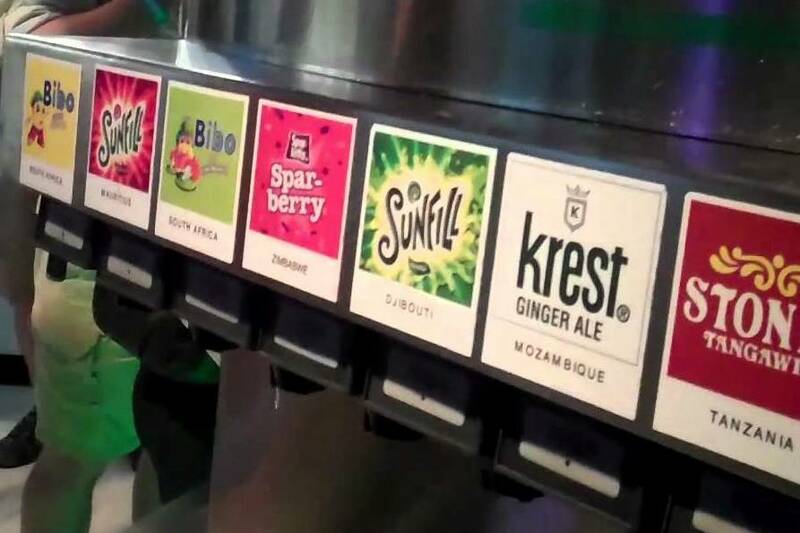 It was a free-for-all of sugary, bubbly drinks. I didn’t know other countries were drinking anything other than classic Coca-Cola. 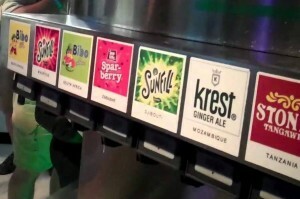 After I tasted some of those other drinks, I was proud to live in America. Really, what was Tanzania thinking?? And we thought New Coke in ’85 was bad! We rolled out of Atlanta and headed for Senoia, Georgia. Which may not sound like a familiar tourist stop to you. Unless, of course, you are a fan of The Walking Dead. Middle and Little are huge Walking Dead fans and we’re just going to skip over the fact that my youngest children have seen one of the most violent, horrific shows on television. Every. Single. Season. I would say there’s some positive underlying themes in that show about endurance or collaboration or moral quandaries but since I have never managed to sit through an entire disgustingly bloody episode, I really have no idea. 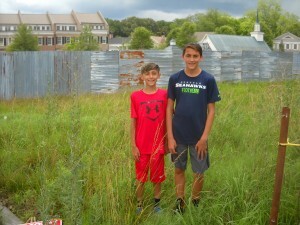 Suffice to say the kids have watched the show, the damage has already been done, the internet was full of information about Walking Dead film locations in Georgia, and part of family vacation is visiting places that are meaningless to you but important to someone else. Compromise. 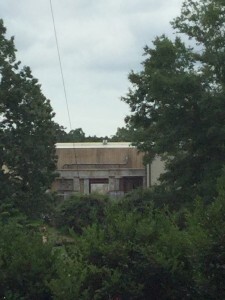 Senoia, Georgia is where they filmed some major scenes of The Walking Dead. Apparently they still film there even now. 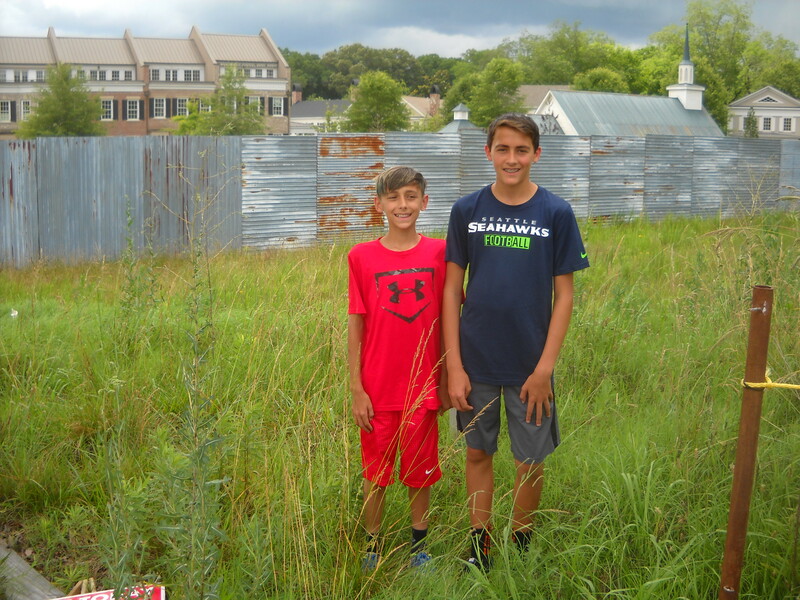 The Walking Dead town of Woodbury is portrayed by the main street of Senoia and the infamous barricade wall protecting Woodbury inhabitants from the zombies is right there at the end of Main Street. For anyone to trespass walk right up to and take a picture. The town of Senoia itself was adorable with cute little shops not related to The Walking Dead as well as a souvenir store, coffee shop, and cafe based on The Walking Dead. 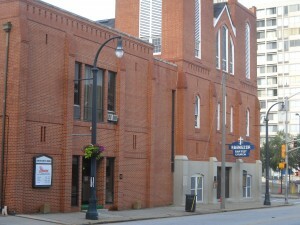 The neat brick buildings and picturesque storefronts reminded me of our own little town. Especially since most of the stores were closed. On a Monday. In the middle of the afternoon. Which is how small town businesses roll. 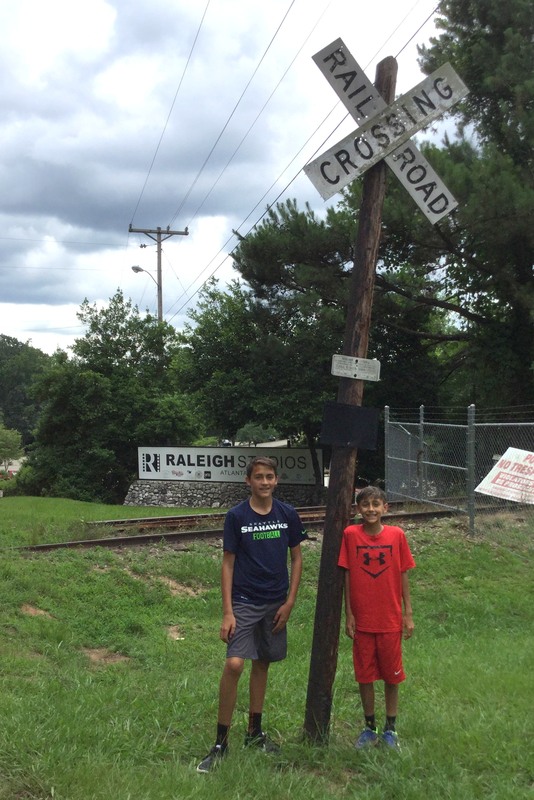 But we did manage to get the boys some t-shirts before driving down some backroads around town to discover the film studio and site for the prison scene. Where we again trespassed walked up and took some photos. From there we found the old grist mill and waterfall that was seen in the last episode of Season 2. They give tours for $10 a person but we prefer trespassing free so we just had a peek from the road. Which required leaning over a fence and peering between trees so I didn’t get a great pic. But the boys saw it and in the future, when they are watching The Walking Dead with their kids (who, having Virtual Reality TV, will be laughing at the cheesy pathetically fake blood and gore) they can say they were there. The next stop was mainly for me. I recently watched the documentary “In Their Own Words: The Tuskegee Airmen.” I tried to get the kids to watch it with me but they insisted they had already seen it. By which they meant they had seen the movie “Red Tails.” Not the same thing. 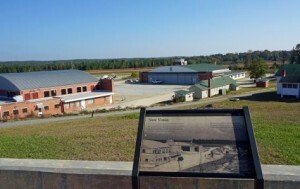 Regardless, we were cutting across Alabama and so we got out at the Tuskegee Airmen National Historic Site. It really is in the middle of nowhere—a few miles away from it I made The Other Half get out at gas station to ask directions because I thought we were lost. But suddenly, off a narrow 2 lane road, there are gates and a landscaped parking lot, and you can stand at the hilltop and look over the entire facility. Set in a peaceful field, surrounded by trees and blue sky, birds and cicadas the only sound for miles. And yet in that quiet place, people changed history. These places are worth stopping to visit. Our last push brought us to Biloxi, Mississippi for the night. 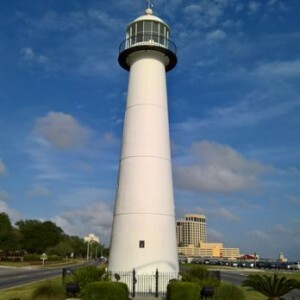 Where we saw the Biloxi Lighthouse. Because you can’t miss it sitting in the middle of the highway. 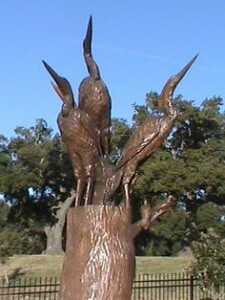 We also passed a lot of the Katrina tree sculptures that were in the middle of the highway, too. This art project by Marlin Miller and Dayle Lewis was a means to preserve the stumps of live oaks killed by the water surge of Hurricane Katrina. They can viewed all along Highway 90. But the best view of all was the first pic of us all together, taken by a friend of The Other Half who treated us to dinner and breakfast while we were in town (Thank you, Jon!). Pretty managed to avoid most family pics because she’s our photographer. Big managed to avoid them because he is too big to drag into photos forcibly. But I really wanted a shot of us visiting the Gulf of Mexico for the first time together and after some complaining and nagging a deal was struck and a photo was taken. Compromise. The glue that binds the family (but can’t make them smile). Lovely trip so far!!! Am really enjoying your adventure. Thanks.